A UMass Boston professor and his colleagues have published new research showing that feeding on human junk food may be altering the course of evolution in Darwin's finches. Assistant Professor of Evolutionary Biology Luis De León says feeding on human foods is weakening natural selection on ground finch beaks, which is what drives the formation of new species in the wild. 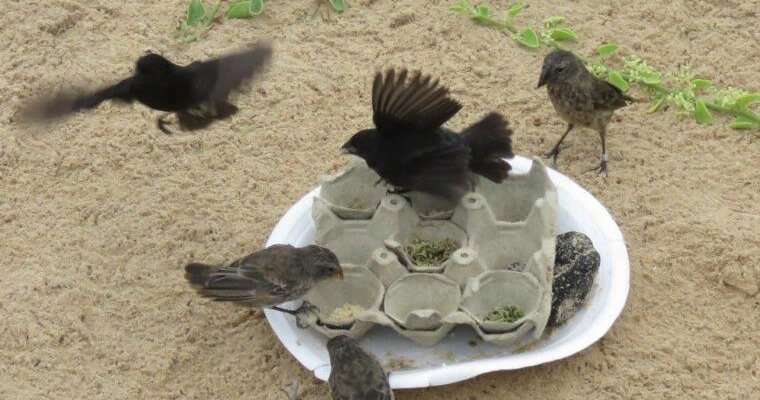 These findings, published in the journal Evolutionary Applications, suggest that the seemingly harmless activity of feeding birds might be altering the course of evolution in the iconic Darwin's finches in the Galápagos islands. "If we continue to feed finches, we're not only affecting the individual species, but the processes that lead to the formation of new species," De León said. "We're getting in the way of evolution." Galápagos finches are famed for being the inspiration behind Charles Darwin's pioneering work on evolution. They are an example of adaptive radiation, an evolutionary process that produces new species from a single, rapidly diversifying lineage. Their common ancestor arrived on the Galápagos about two million years ago, and since then Darwin's finches have evolved into more than a dozen recognized species differing in body size, beak shape, and feeding behavior. De León and fellow researchers from UMass Amherst, Universidad San Francisco de Quito, McGill University, and Norwegian University of Science and Technology were on Santa Cruz Island when they found two forms of medium ground finches—a small and large version—while studying beak size at an isolated, pristine site. When they repeated the same set of measurements at a nearby urban site, the distinction between the two beak sizes was not present. Studying data collected by other researchers in the 1970s, the researchers could see the two types of medium ground finches had been present in the area before, but something had changed in the last 40-50 years. They hypothesized that the change might have to do with urbanization and the rapidly increasing human population in that area. In particular, the introduction of novel foods brought by humans. Using egg crates filled with natural seeds and human junk food—chips, cookies, and rice—the researchers tested to see if the finches were in fact feeding on human food and what their preference was, weighing the food before and after to see how much was eaten. De León said they found that finches in the urban area were almost exclusively feeding on human food. When the experiment was repeated at an isolated site in nature, the finches ignored the trays. 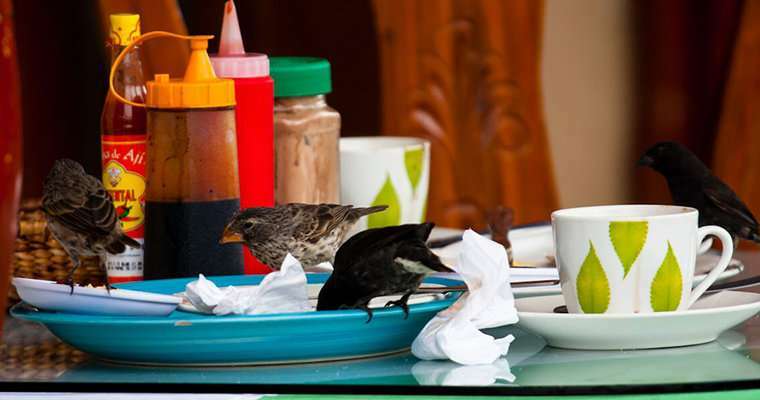 They found that "urban" finches feed on human junk foods, and in fact prefer these foods over their natural diet. This indicates that ongoing urbanization in the Galápagos is eroding the ecological differences that originally drove the formation of species in Darwin's finches. "In contrast to their natural diet, the finches are changing their diet to human junk food," De León said. "We know one way finches diversify and become new species is by specializing in different food types. All three or four species of ground finches at urban sites on Santa Cruz Island seem to be converging onto the same junk food diet. If that's the case, the selection pressures that would be naturally keeping them apart would be weakening, possibly leading to the collapse of the adaptive radiation of ground finches." Researchers also found a strong preference for human foods at EG Beach, a non-urban site visited by tourists located 12 kilometers away from the town of Puerto Ayora. This suggests that human behavior, rather than human population density, is the main driver of finches' preference for human food, expanding the impacts of urbanization beyond city centers. Now that the researchers know that finches are changing their diets to human junk food, they need to look at the consequences for the actual evolution of the species on this island. "When thinking about preserving biodiversity in general, we often focus on preserving individual species," he said. "What we show with this work is we also need to consider preserving the processes that lead to the formation of species." De León and a PhD student will return to the Galapagos in January. De León said they will continue to do more genetic analysis, looking at whether there is an increase in gene flow across the four species of ground finch. Now that the birds are eating the same diet, researchers want to know if they are also interbreeding. Elaine Montes, a second-year PhD student at UMass Boston who is working with De León, will look at the physiological consequences of human junk food on Galapagos finches by analyzing telomeres, a long chain of repetitive DNA at the end of every chromosome that can shorten due to stress and aging. "We want to see whether they have a shorter life span than birds in nature," he said. De León has worked at UMass Boston for two years. 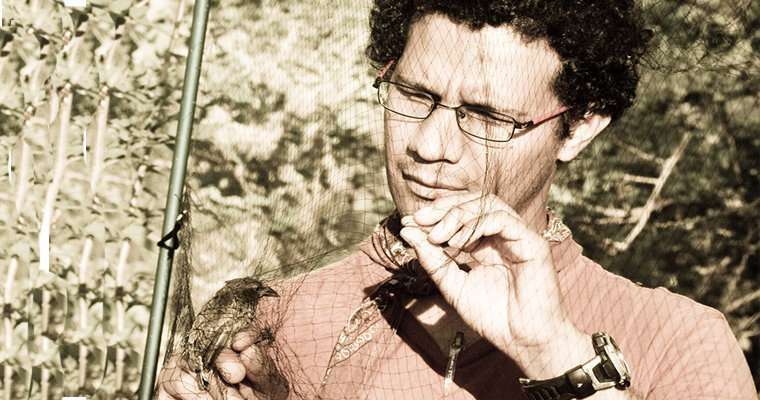 He received his PhD at McGill University, where he started his work on Galapagos finches 14 years ago. "It's a fascinating place. Every species is so unique; it captures your imagination. You can imagine how Darwin was fascinated by looking at all those species," he said. "I feel privileged to essentially walk in Darwin's footsteps." "Getting in the way of evolution." Rank teleology. We cannot know the objective of evolution. True -- about teleology -- but this might have been careless speaking or careless journalism. As I'm sure you know, "getting in the way of evolution" was likely to mean "altering the working of evolutionary processes," which is a very different thing. I did find this press release a bit muddled, but it's probably the fault of the release writer, not the researchers.